I am 37 years old grow up with an atheist father and mentally ill fundie mother. I have never really believed in a god. I had a spell not long after I married that we tried to go to church (my husband is a believer) but, I was just going to make him happy. The pastor at the church was asked to leave over wanting a previous married deacon to become a pastor. My mentally ill mother asked the new pastor a few question about what he believed and he asked my husband not to tell me but, he was concerned about her soul. All "hell" broke lose that is one thing I could never accept asking him not to tell me about my own mother. I guess I am a feminist because I can't understand that. She is my mentally ill mother; I know her, not my husband. I guess that sent me even more in my strongly atheist base, and I have gotten stronger in my atheism everyday. My husband is a good guy and a great father but, we fight over religion, politics, and gun control. I grew up with a lot of guns; my atheist father is a gun nut (lol), but I hate guns. I know too many mentally ill people and bullies with guns and it scares me. I am kind of in free fall. I live in the South and I am a anti-gun, pro-union, democrat, pro-gay married, southern girl. 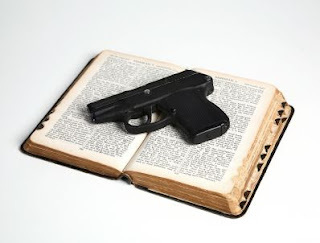 I would love any feed back in how you all deal with this crazy bible/gun obsessed country.